The creative process in photography – How important this process is? 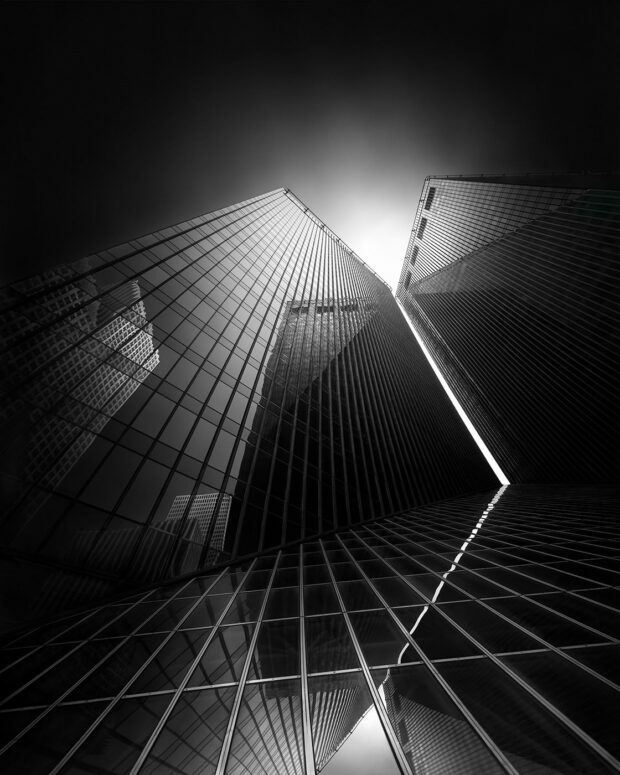 Equivalents I (Pennzoil Place, Houston TX – Arch. Phillip Johnson) is the start of a new black and white fine art series and maybe a new direction in my work, a direction not so minimalist as before, with more complex subjects and relations among them. As always, my creative process in photography is based on my interpretation of the world, my images are born from my experiences and what I do is to tell my stories through them. I tell my stories through black, white and shades of gray, through lines and shapes. Every tone in my images means something, every line, every accent, contrast or the lack of it. This is why I call this series Equivalents and I mean it as an homage to Alfred Stieglitz, the one who used this word for the first time in the beginning of 20th Century to create the first abstract photography series, when he shot more than 200 photographs of clouds, deprived of any other context, aiming with this series to capture only the feeling in his images and to find a channel of communication with the viewer beyond known shapes or subjects. The fact that I’m photographing clouds too when I shoot long exposures may be just coincidental, but maybe not. maybe clouds are indeed a good tool to communicate with the viewer through their symbolism. For me, they are one of the aspects of my creative process in photography. Here is a short but very interesting video that talks about this series and why Stieglitz was photographing clouds. UPDATE: In case the video below is not working try this Wayback Machine alternative link. Stieglitz is one of the most important photographers, artists and thinkers of 20th Century. He was not only a photographer, but also a theoretician and one of the souls of NYC’s and the entire US photography life at the beginning of the century, his influences going way beyond the US and spreading out in the whole world. Through the Photo-Secession Group he founded and the magazine they were issuing, called Camera Work, also through his gallery where he exhibited young fine art photographers (that’s where the work of Ansel Adams was exhibited for the first time), he fought to make photography accepted as a fine art medium and he managed to change the way people view photography, from a mean of documenting the world to a mean of interpreting the world. One of the tools he used to do that was to photograph clouds as a way of showing that the subject is of little importance in fine art photography, that what is important and what creates art is the vision of the artist interpreting the subject. This is what I strive for too, in my photography work and my writings, in my work with my workshop and mentoring students and also through this blog and other channels I have to communicate with people: to make photography accepted as more than photography in the traditional sense of the word, as (en)Visionography – the art of expressing our internal world through the images we create and the result of our personal creative process. This is the aim of art and its sole purpose, to serve the artist as a tool for expressing his beliefs and feelings related to the world he perceives. You can read much more about my philosophy, and also how I put it in practice, how I create the images I create, in my 424-page book From Basics to Fine Art – Black and White Photography, and in my video tutorial and eBook Long Exposure, Architecture, Fine Art Photography – Creating (en)Visionography . Alternatively, you can come to one of my workshops where you hear everything about it in person and see a demo of my entire creative and processing workflow. This image was shot in Huston and it shows one of the icons of the city and of modern architecture in general, Philip Johnson’s Pennzoil building. It was taken quite some time ago, but only now it was ready to be interpreted and processed. I sometimes need a long time to start working on a certain image, even if I may know from the beginning that I will work on it. This happens because creating fine art photography means expressing yourself and sometimes you need to wait for the right experiences and the right state of mind or to have a certain interpretation of the world, in order to create a certain image and make it represent the essence of both the subject and of the artist’s mind and soul. Art is not a question of quantity, is not a question of speed, of producing work in an intense rhythm. It is a question of creating with authenticity and as a result of an internal need to express an idea or feeling. This is why art will show exactly the personality of an artist if we know how to read it. Artists who are preoccupied by the detail by the accuracy in expressing an idea and in creating the material form of this idea, which is the image, in fine art photography, will need a longer time to craft their images in order to express their ideas. If you belong to this category, don’t be afraid if you don’t produce a lot, just be interested in the quality, the honesty and authenticity of your work. This is what will make a real work of art, this is what will outlive you and will keep your ideas and soul alive forever. This image was not an easy image to process, as all the images that have a lot of detail and where you need to create a hierarchy in the importance of the elements you show, so they culminate with the most important point in the image: your subject. I needed many hours of tweaking and changing the balance between contrasts and tones till I brought everything together and the images spoke to me with the voice I intended it to have: the voice of my VISION. It is an image that also needs some time to be read, as it needed time to be created. You will see in some areas very subtle difference in tones and probably with the compression of the internet you will lose a lot of its subtlety. But I can tell you: it is there. This is part of my visual language and one of my mantras, also one of the best pieces of advice I could give to a fine art black and white photographer: to create the most subtle difference in tones, many times imperceptible if you don’t look carefully at the large size of the image. This is one of the images that really needs to be seen printed in large so to notice every detail. The same stands for my next image that I will publish soon: Equivalences II – shot in London. You can see these subtle changes the image underwent during my processing in this video where I show the Before, After and in-between states of my image and how it evolved from the RAW state to the final image. You can read this article I wrote if you want to consult a more in-depth tutorial about the creation of a fine art architectural photograph. Vimeo version of the video is available too. I think this is going to be a longer project for me, as I have many ideas to explore, not only architecture but other subjects too, maybe even people. In parallel, I will continue to work on my tilt-shift blur long exposure series Fluid Time and I have some other ideas waiting in line to find the time to put them in practice. Posted in Architecture Black and White Fine Art, Tutorials Fine Art Black and White Photography. RSS 2.0 feed.